Many people go into truck driving because they like the solitude the job provides. If you thrive on conversation and company, however, team driving allows you to enjoy that while still being able to pursue your job of choice. Many truck drivers find that it is easier to stay alert and keep from getting bored during long drives if they have a second driver with them. You have a partner in mind. If you have a specific truck driving partner in mind, that may be even more of an incentive for you to pursue team driving. 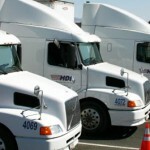 If your partner is your spouse, of course, that enables you to keep all of your truck driving earnings in the family. If you don’t have a partner in mind, the trucking company you work for can help you find a driver who will be suited to your personality. You want to earn more. Normally, truck drivers need to take breaks from driving to sleep. When you’re sharing your ride with another driver, you can take turns behind the wheel, which means that you can cover a lot more miles than you would otherwise. While you will be splitting your earnings with your partner, you can still end up making more money from truck driving this way. Yuma Truck Driving School offers a number of options for aspiring truck drivers, including classes in the evenings and on weekends. We also offer financial assistance for students who qualify. If you’re eager to get your commercial driver’s license so you can get started on your new career, your journey begins by contacting us! You can reach us at (888) 647-3239.